If you’re under 40, chances are you will have never heard of Love Boat or its many TV offshoots. Love Boat was a popular hit US television series set on a cruise ship and broadcast across the world from 1977 until 1986 (in fact, many European channels STILL show it). Cheesy, bland and glossy: Love Boat was all of these things and much more. But if you were a fan you'll love this faithfully-recreated online slot. 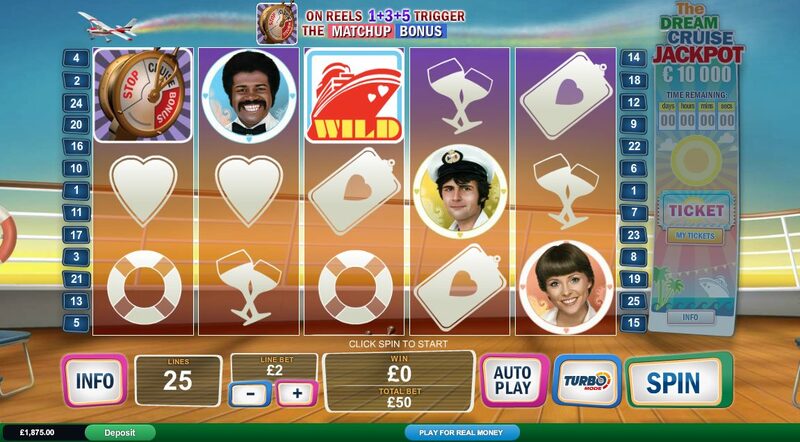 Love Boat is a 5-reel, 25-payline slot from slot developer Playtech and if you were a fan of the show then you will certainly want to give this slot a go. Fans of the show will instantly have memories of the show flooding back as the catchy theme tune plays in the background as the reels load. You can then play from 25p per spin, meaning that there are some big prizes to be won when playing on this slot. Let’s cut right to the chase. The main draw of this slot is the Love Doctor Free Games Bonus. You will immediately be awarded with 10 free spins when you hit the Love Boat logo symbol and there is also the chance to build up your multiplier value that will be added to wins during the free spins. Every time you hit Doctor Love on the reels during the free spins he will the love meter to the left of the reels by one and will trigger a new feature offering a prize. Prizes to be won in this bonus include Freezing Wilds, free spins and multipliers. 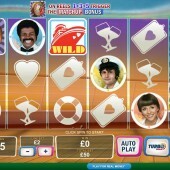 The bonus feature in this slot that takes the most inspiration from the show is the Match Up Bonus. This bonus is triggered when you hit the speed control symbols on Reels 1, 3 and 5. This is pretty much where you play matchmaker and win prizes based on the compatibility of the guy and the girl you choose to match up. Unfortunately, you cannot influence their compatibility. Yes, it would have been nice if Playtech allowed you to offer the lady some flowers or hand the guy a copy of Call of Duty but it is not to be. The more compatible the couple is, the larger the prize you will take home. There is a multiplier value up to 5x that can be won if the couple think they are both their “one true love”. This is not where the cruise ship fun ends. There is also the Dream Cruise Jackpot that is open to players that hit the Jackpot symbol on the 5th reel at any time. If you are lucky enough to hit this symbol on the 5th reel then you will be entered into the weekly raffle to try and win the $10,000 jackpot prize. A raffle is drawn every week so there is a chance every time you play this slot to be entered into the raffle to win the jackpot. Love Boat was a television series that drew its lovers and haters. It was like a 1970s and 1980s version of One Tree Hill, just with less teenage angst and more mid-life crises. The game has the same kind of feel as the popular Baywatch slot from Playtech and the Six Million Dollar Man slot from the same developer. Fans of the show will immediately flock to play this. Haters of the show will no doubt be cursing the show’s return to daylight but it might be worth putting your prejudice to one side because underneath it all this is a fairly enjoyable slot.